Grass Fed Whey Protein Concentrate, Organic Erythritol, Organic Creamer Base™ (Organic Acacia Gum, Organic High Oleic Sunflower Oil, Organic Inulin, Organic Rice Dextrins, Organic Rice Bran Extract, Organic Rosemary Extract), Cocoa Powder, Natural Flavors, Cellulose Gum, Xanthan Gum, Sea Salt, Potassium Chloride, Organic Stevia. Mix 2 level scoops (41g) with 10-12 fluid ounces of water, organic milk, or almond milk and shake in a shaker cup or use blender. Grass Fed Whey Protein Concentrate, Organic Erythritol, Organic Creamer Base™ (Organic Acacia Gum, Organic High Oleic Sunflower Oil, Organic Inulin, Organic Rice Dextrins, Organic Rice Bran Extract, Organic Rosemary Extract), Natural Flavors, Cellulose Gum, Xanthan Gum, Sea Salt, Potassium Chloride, Organic Stevia. When we decided to make an Orgain whey-based protein powder, we had a very clear goal in mind: to create the best whey protein powder possible. We wanted an ultra-clean ingredient list and incredible taste and texture. It wasn't easy, but we've finally created the whey protein of our dreams. 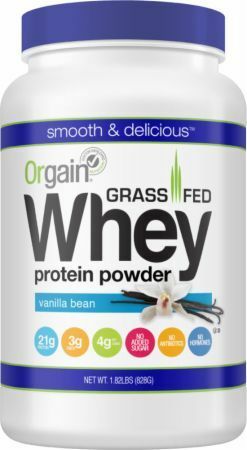 Each serving of Orgain Whey Protein has 21 grams of grass-fed whey protein sourced exclusively from New Zealand. It has no added sugar and it tastes amazing. Once you try it, no other protein powder will do.